18 DCI corps in the running for $20,000 need your votes! They say power lies in numbers, and those involved in marching music have that. Drum corps fans have proven more than once that we form a strong community when we work together, and it's time to prove that again! 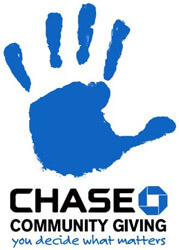 Chase is once again presenting its Chase Community Giving (CCG) campaign, which funnels philanthropic funding directly to charity organizations. In its second CCG program, the company is donating a total of $5 million. The charity with the most votes gets $250,000, four runners up will receive $100,000, and the other 195 organizations to make it into the top 200 will receive $20,000 a piece. So, how can you help? Those with a Facebook accounts are able to add the CCG app to their profiles and place their votes from there. You can search for corps from the CGM homepage on Facebook or just click the links below to be taken directly to their individual voting pages. Every Facebook user gets 20 votes, only one of which can be used per organization, so make sure to support more than one corps! Voting ends very soon on Monday, July 12, with the announcement of the 200 winning charities coming on July 13. Help support these corps today! Learn more about CCG and vote today on Facebook!